The Festival continues to grow. Further improvements have been carried out to make a visit to the show even more homogeneous and ensure that it corresponds better to current developments in the boating industry. The Pantiero terrace traditionally welcomes exhibitors offering deck fittings, services, engines…To develop this section, the direction of the flow of visitors has been studied. Now, visitors will move along a single path to discover these well-known exhibitors. With an in-water exhibition area that grows bigger from year to year, the Multihull Section is a must for all those who love Multihull cruisers both sail and motor. The largest shipyards in Europe and worldwide come here to officially unveil their new models. This year again, the Multihull Section is being set up right in the heart of the Vieux Port on the central pontoon accessible from both the Esplanade de la Pantiero and the Quai Saint-Pierre footbridge which has been moved slightly to ensure maximum space in the Multihull Section. This is a unique exhibition gathering the world’s largest concentration of multihulls, with a very wide range of vessels from 10 to 36 metres, both sail and motor. This year sees the creation of a new area for Inflatable Crafts (Espace Pneumatique) set up at the junction of the swing bridge (Traversante) and Quai Max Laubeuf. An area totally dedicated to all forms of inflatable craft and rigid inflatable boats (RIB). Numerous French, Italian, and other European makes responded immediately to this initiative which recognizes the popularity of this type of boat among a public of loyal connoisseurs. In addition to the display on land which occupies the entire tip of Quai Max Laubeuf and a large part of the esplanade behind it, lovers of inflatable craft will enjoy discovering a number of the new models displayed in water. The 34th Festival retains, of course, the important features that made it so successful to begin with, namely a particularly exhaustive offer of both small and large vessels, sailing and motor boats, 95% of which will be displayed in water and able to be tested at sea. The Festival is the showcase of a worldwide industry that has been concerned for a long time now about its impact on the environment. To one degree or another, each of us strives to display the most virtuous behaviour possible. Parts manufacturers, engine builders and boatbuilders have all undertaken initiatives in this direction. Like purchasing a car, the decision to buy a boat, regardless of its size, should be accompanied by thoughts of the future, about one’s true commitment to sustainable development and protecting the environment. Just having a solar generator is no longer enough. We need to look more long term. Whether sail or motor, every boat has a lifecycle which starts with its conception through its long period of use to its eventual destruction. In other words, throughout this cycle like any manufactured article it generates forms of pollution; for all that, according to Greenpeace, less than 1% of ocean pollution is due to pleasure boating. So at each stage in the lifecycle of a boat, the shipyards actively do many things, from building the boat, through maintaining it during the long period it is in use, to recycling all the material when it comes to the end of its life. If all the cycles are respected, the environmental impact of yachting on nature will be reduced. Whether sail or motor, the new generation of boats, as well as their owners, must first and foremost adopt an eco-responsible attitude. 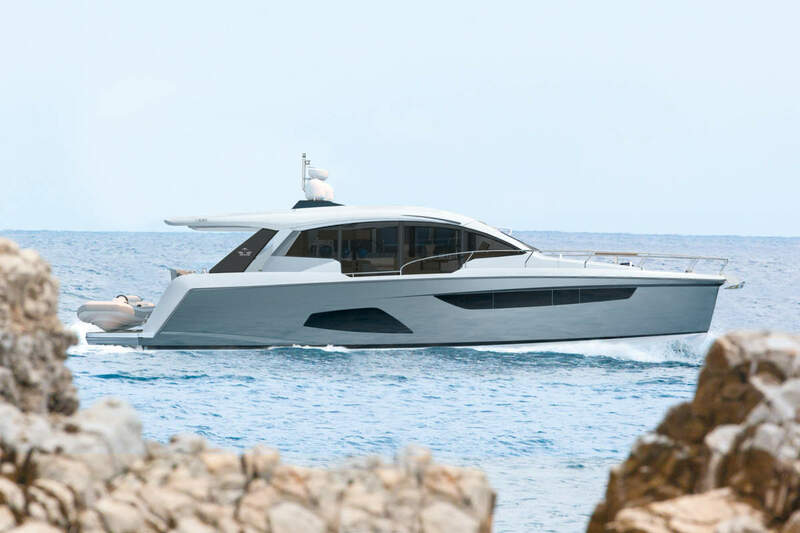 With close to 470 new boats on display in water, the Vieux Port knows just how to debut the finest new models by major international shipyards in a sumptuous setting. The quality and density of the Festival stands out through a mixed offer of motor boats and sailing boats from 10 to 50 metres on the water and the presence on land of numerous exhibitors dedicated to services and equipment for increasingly sophisticated boats. In water 470 boats registered with more than 200 new models making their world debut On land 80 boats under 10 metres.